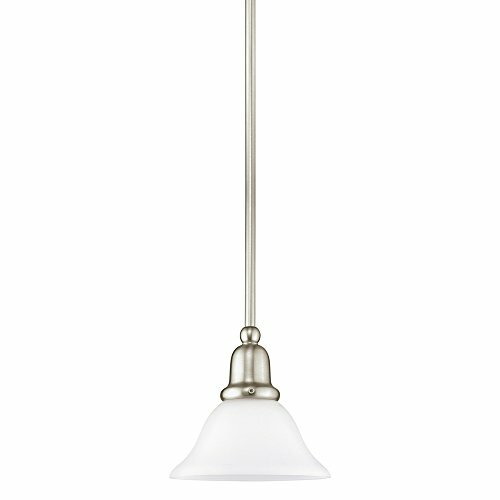 The Sea Gull Lighting Sussex one light mini pendant in brushed nickel is the perfect way to achieve your desired fashion or functional needs in your home. The Sussex lighting collection from Sea Gull Lighting is a perfect crossover from cottage style into urban chic. The Sussex collection's retro appeal softens and warms-up contemporary spaces, while retaining an up-to-date decor. Look to Sussex when balance and unity are required in your interior design. Offered in Brushed Nickel finish with Satin White glass or Heirloom Bronze with Satin Etched glass. For the wall/bath fixtures only, a Chrome finish coupled with Satin White glass is also available. The assortment includes nine-light, five-light and three-light chandeliers, pendants in six sizes, both flush and semi-flush ceiling fixtures, as well as one-light, two-light, three-light and four-light wall/bath fixtures. Both incandescent lamping and ENERGY STAR-qualified fluorescent lamping are available. Most of these fixtures easily convert to LED by purchasing LED replacement lamps sold separately. 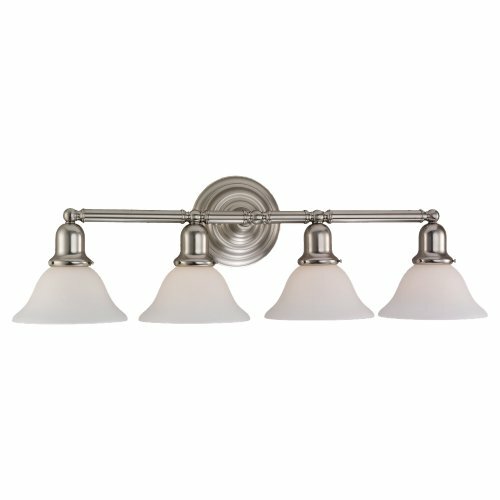 The sea gull lighting Sussex four light vanity fixture in Brushed Nickel provides abundant light for your bath vanity, while adding a layer of today's style to your interior design. The Sussex lighting Collection from sea gull lighting is a perfect crossover from cottage style into urban chic. The Sussex collection's retro appeal softens and warms-up contemporary spaces, while retaining an up-to-date decor. Look to Sussex when balance and unity are required in your interior design. Offered in Brushed Nickel finish with satin white glass or heirloom bronze with satin etched glass. For the wall/bath fixtures only, a chrome finish coupled with satin white glass is also available. The assortment includes nine-light, five-light and three-light chandeliers, pendants in six sizes, both flush and semi-flush ceiling fixtures, as well as one-light, Two-Light, three-light and four-light wall/bath fixtures. Both incandescent lamping and energy star-qualified LED lamping are available. Most of these fixtures easily convert to LED by purchasing LED replacement lamps sold separately. The Sea Gull Lighting Sussex two light vanity fixture in brushed nickel provides abundant light for your bath vanity, while adding a layer of today's style to your interior design. The Sussex lighting collection from Sea Gull Lighting is a perfect crossover from cottage style into urban chic. The Sussex collection's retro appeal softens and warms-up contemporary spaces, while retaining an up-to-date decor. Look to Sussex when balance and unity are required in your interior design. Offered in Brushed Nickel finish with Satin White glass or Heirloom Bronze with Satin Etched glass. For the wall/bath fixtures only, a Chrome finish coupled with Satin White glass is also available. The assortment includes nine-light, five-light and three-light chandeliers, pendants in six sizes, both flush and semi-flush ceiling fixtures, as well as one-light, two-light, three-light and four-light wall/bath fixtures. Both incandescent lamping and ENERGY STAR-qualified fluorescent lamping are available. Most of these fixtures easily convert to LED by purchasing LED replacement lamps sold separately. 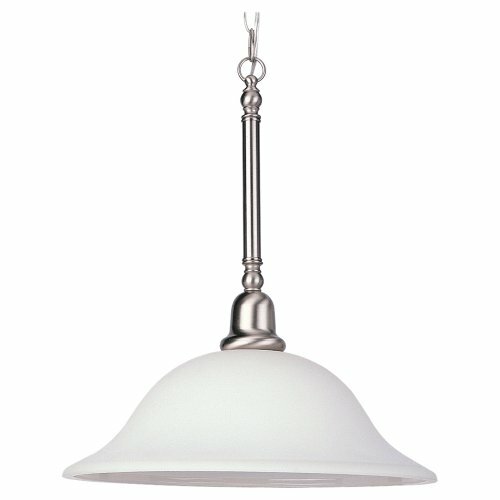 The Sea Gull Lighting 66060-962 Sussex collection Pendant Lighting in Brushed Nickel uses Incandescent light output and brings Transitional style. This item is 20"H. The wattage is 100. The Sea Gull Lighting 66060-962 requires 1 bulb (not included). Additional Information: Shade-Satin White Glass. 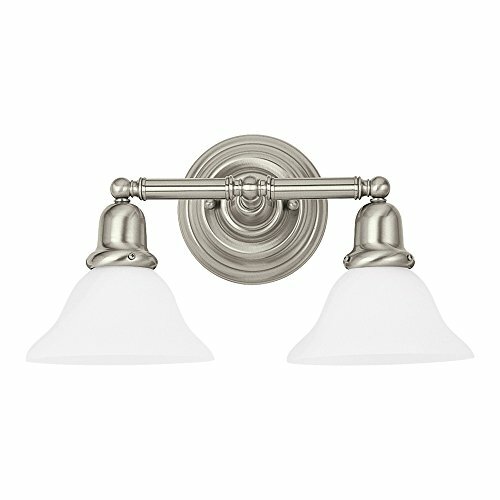 The Sea Gull Lighting 44060-962 Sussex collection Sconce Wall Lighting in Brushed Nickel uses Incandescent light output and brings Transitional style. This item is 10.25"H x 7.5"W x 7.5"L. The wattage is 100. The Sea Gull Lighting 44060-962 requires 1 bulb (not included). Additional Information: Shade-Satin White Glass. Sea Gull Lighting is one of the most sought after brand names for decorative, functional, specialty indoor lighting and outdoor lighting fixtures. 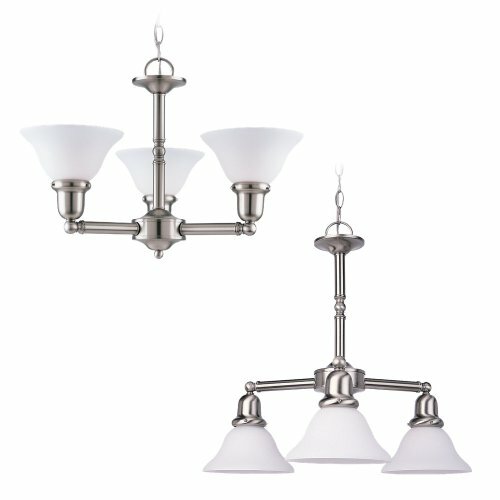 The Sea Gull Lighting 31060-962 Sussex collection Chandelier Lighting in Brushed Nickel uses Incandescent light output and brings Transitional style. This item is 15.5"H. The wattage is 300. The Sea Gull Lighting 31060-962 requires 3 bulbs (not included). Additional Information: Shade-Satin White Glass. 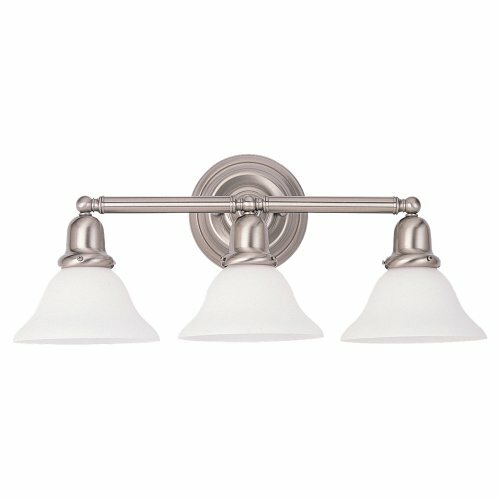 The Sea Gull Lighting Sussex three light semi flush fixture in brushed nickel is the perfect way to achieve your desired fashion or functional needs in your home. The Sussex lighting collection from Sea Gull Lighting is a perfect crossover from cottage style into urban chic. The Sussex collection's retro appeal softens and warms-up contemporary spaces, while retaining an up-to-date decor. Look to Sussex when balance and unity are required in your interior design. Offered in Brushed Nickel finish with Satin White glass or Heirloom Bronze with Satin Etched glass. For the wall/bath fixtures only, a Chrome finish coupled with Satin White glass is also available. The assortment includes nine-light, five-light and three-light chandeliers, pendants in six sizes, both flush and semi-flush ceiling fixtures, as well as one-light, two-light, three-light and four-light wall/bath fixtures. Both incandescent lamping and ENERGY STAR-qualified fluorescent lamping are available. 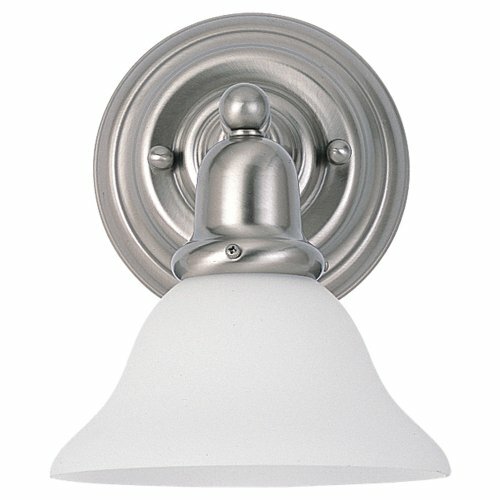 Most of these fixtures easily convert to LED by purchasing LED replacement lamps sold separately. 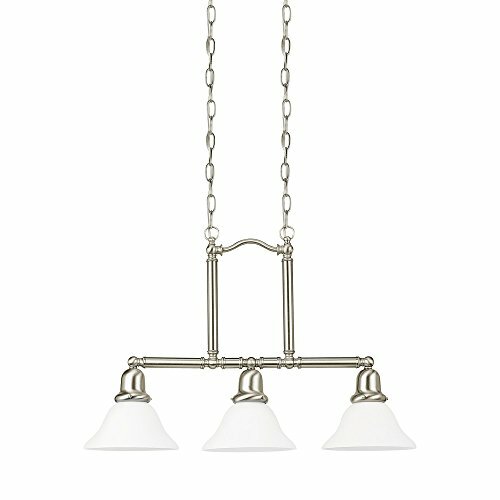 The Sea Gull Lighting Sussex three light indoor pendant in brushed nickel supplies ample lighting for your daily needs, while adding a layer of today's style to your home's décor. The Sussex lighting collection from Sea Gull Lighting is a perfect crossover from cottage style into urban chic. The Sussex collection's retro appeal softens and warms-up contemporary spaces, while retaining an up-to-date decor. Look to Sussex when balance and unity are required in your interior design. Offered in Brushed Nickel finish with Satin White glass or Heirloom Bronze with Satin Etched glass. For the wall/bath fixtures only, a Chrome finish coupled with Satin White glass is also available. The assortment includes nine-light, five-light and three-light chandeliers, pendants in six sizes, both flush and semi-flush ceiling fixtures, as well as one-light, two-light, three-light and four-light wall/bath fixtures. Both incandescent lamping and ENERGY STAR-qualified fluorescent lamping are available. Most of these fixtures easily convert to LED by purchasing LED replacement lamps sold separately. 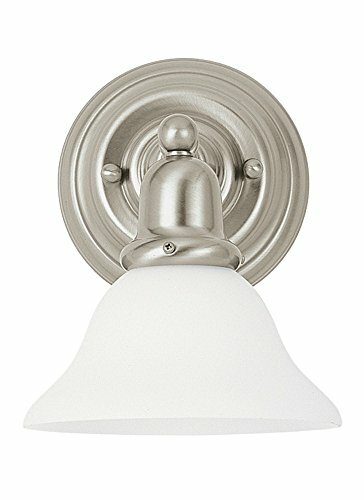 The Sea Gull Lighting Sussex one light wall sconce in brushed nickel is an ENERGY STAR qualified lighting fixture that uses fluorescent bulbs to save you both time and money. The Sussex lighting collection from Sea Gull Lighting is a perfect crossover from cottage style into urban chic. The Sussex collection's retro appeal softens and warms-up contemporary spaces, while retaining an up-to-date decor. Look to Sussex when balance and unity are required in your interior design. Offered in Brushed Nickel finish with Satin White glass or Heirloom Bronze with Satin Etched glass. For the wall/bath fixtures only, a Chrome finish coupled with Satin White glass is also available. The assortment includes nine-light, five-light and three-light chandeliers, pendants in six sizes, both flush and semi-flush ceiling fixtures, as well as one-light, two-light, three-light and four-light wall/bath fixtures. Both incandescent lamping and ENERGY STAR-qualified fluorescent lamping are available. Most of these fixtures easily convert to LED by purchasing LED replacement lamps sold separately. 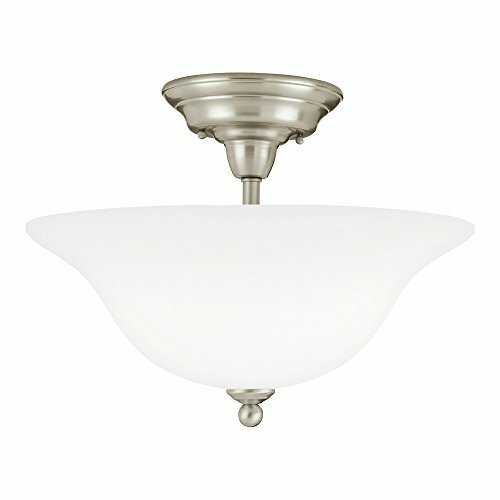 Compare prices on 962 Sussex One Light at ShopPlanetUp.com – use promo codes and coupons for best offers and deals. We work hard to get you amazing deals and collect all available offers online and represent it in one place for the customers. Now our visitors can leverage benefits of big brands and heavy discounts available for that day and for famous brands.